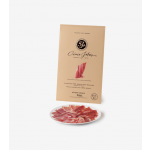 Enjoy the luxurious pleasure of a gourmet jamón ibérico with the ultimate convenience of handy pre-sliced packets. The packs are vacuum sealed imediately after slicing to ensure full freshness and flavor. Three ounces is the perfect amount to serve as an aperitivo with an intimate group of good friends who appreciate the best things in life. What could be better than offering the gift of health, in handy pre-sliced packets of multisensory culinary pleasure? 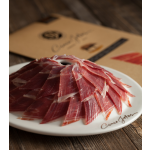 Delicious sleeves of sliced acorn-fed 100% jamón ibérico, brought to you from Jabugo, a village in southwest Spain. 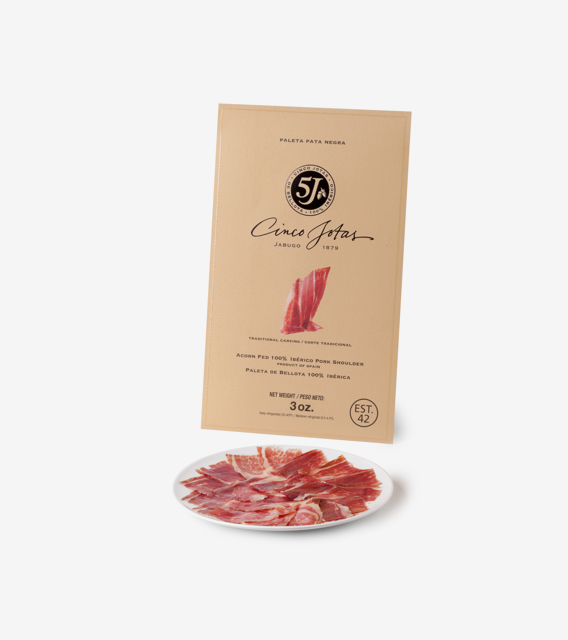 Ham aficionados worldwide recognize the Cinco Jotas brand as one of the most authentic culinary pleasures that money can buy. Acorn-fed 100% ibérico ham is known for its exquisite aromas, textures and flavors, but what a bonus to discover that this delicacy of nature is also good for your health. Iberian de bellota ham has a series of nutritional properties that are sometimes overlooked. Acorn-fed hams have a higher concentration of amino acids for each gram of protein and a larger volume of healthy intramuscular fat. Since their natural diet consists of acorns in abundance (in addition to wild herbs, mushrooms, roots, and more), the oleic acids contribute to healthy cholesterol content considered healthy by experts in nutrition. Packets come with easy-to-separate slices to facilitate their beautiful display. Serve the ham, arranged slice by slice, on a on a warm, flat plate. Eating this delicacy with your fingers is not only allowed but enthusiastically encouraged to enjoy the full tactile experience. What happens when you combine the most exclusive ham in the world with other national treasures of Spanish cuisine? Cinco Jotas Ham is the undisputed star of many recipes from great chefs. But sometimes you like to keep it exquisitely simple and easy. Try the jamón with bread, tomato, fried eggs and french fries or place some ham slices on the top of a lentil salad or any other legume or vegetable salad. Simply delicious! You may not have your own sommelier to advise on the perfect wine pairing for this exclusive acorn-fed ham, but we're certainly happy to give you some pointers! A nice Manzanilla sherry from Andalucia always works or else a hearty Rioja. Why don't you try with a sublime Spanish red or White wine. Beginning from 1879, the ancestral tradition of breeding, producing and hand carving Cinco Jotas Iberian ham has become legendary. With 140 years of experience ensuring purity and authenticity, the estemed brand is considered amongst the best pork products in the world. This is indeed why Cinco Jotas acorn-fed 100% ibérico ham is considered one of Spain's national treasures.